April showers bring May flowers, and it has definitely been “showering” here in Dallas the past few days. Doing your makeup can be a drag when it is pouring outside and the last thing you want is having your makeup slide all over your face and wash off. On extremely rainy days I like to use the five following rainy day makeup essentials that stay put come rain or shine. 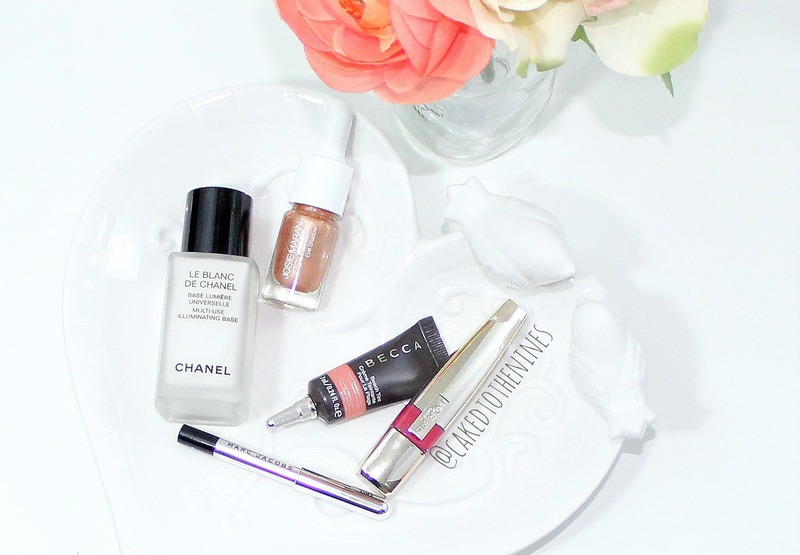 Chanel Le Blanc De Chanel | The key to making your makeup last is primer. It’ll give your foundation something to stick to and elongate the wear of everything you put on top of it. This Chanel base is a great one that also adds some luminescence. I’ve done a full review on it here. Josie Maran Rio De Rose Gold Coconut Watercolor Eyeshadow | I find that my eyeshadow washes off faster when it rains, and that is when I grab my Josie Maran Coconut Watercolor Eyeshadow. This beauty applies like a liquid and then dries down completely, but still keeps that beautiful rose gold shine. Basically, it’s like liquid lipstick for your eyes. That may sound scary, but if you live somewhere rainy (or extremely hot) this eyeshadow won’t budge. I need to get some more of these! Becca Grapefruit Beach Tint | Becca hit the mark when they made these beach tints that are specifically made to add a sheer stain of color that will stay put while you go out and indulge in the beach. The same can be said for those rainy days when you want to add some color to your lips or cheeks without it washing away. They’re also infused with Vitamin E that will keep your skin looking and feeling healthy, which is something I look for when the weather outside is quite harsh. Marc Jacobs Gel Eye Crayon in Blaquer | Back in my middle school days I was known for wearing dark black eyeliner all over my eyes– on top and on my waterline. Essentially, I looked like a racoon. Now that I’ve grown up and my makeup taste has (thankfully) changed, the racoon look is no longer something I strive for. If you want to prevent that from happening to you when it’s raining, this eyeliner is the way to go. It is very creamy and glides on easily, but once it dries down it won’t budge, which makes it perfect for a rainy day. L’Oreal Endless Red Lip Stain | Matte lipstick is my favorite, and although it may last a long time on the lips, nothing lasts longer than a stain. This stain goes on glossy and then dries down to a matte finish that will last for several hours. It does fade a bit patchy, but you can just swipe on some more and even it out. This is a must have for me on rainy days because it adds a juicy red wash of color and won’t smear off once it dries. What are your rainy day makeup essentials? Let me know in the comments below!